Connect With VAHAN ATTENTION VAHAN lovers... Let’s stay in touch on Social Media! Always a Smart Decision On February 14, we are given a day to celebrate our love and have an excuse to spoil our Valentine. Flowers are always a must, as well as a good box of chocolates to devour together. Unfortunately, once the fun is over we are left with wilted flowers and chocolates that have now turned in to calories we really didn’t need. It's All in the Details You know how a great bag or the perfect pair of shoes can pull an entire look together? It's almost as if that particular piece makes everything else being worn less important. I could be wearing old jeans and a basic white top, but if my shoes and bag are on point, the whole look just works. I always loved the idea of fine jewelry, but my lifestyle is more casual with small kids. Hence, when I was first introduced to VAHAN…I immediately thought it was the perfect blend of quality and design. I wanted to share with you today some images I styled with Vahan's stunning jewelry collection, an opportunity I've been looking forward to for a long time. Today, I’m partnering with VAHAN Jewelry to share a bit more about this exquisite fine jewelry brand founded by French designer, Leon “Sacha” Der Calousdian, in 1968. For 50 years, VAHAN has been creating timeless collections of women’s luxury jewelry. The VAHAN Style team is here to help you curate your perfect jewelry look whether it is back to school season, back to the boardroom or you are simply looking forward to enjoying an extended summer. Make Today a Hollyday with a Bracelet Giveaway! Today I wanted to take a break from the craziness to share one of my FAVORITE jewelry brands, Vahan Jewelry! Vahan Jewelry is a luxury jewelry line that has been around for over 50 years and has a line that is classic and sophisticated for any age! So what is all this fabulousness on my wrists?! 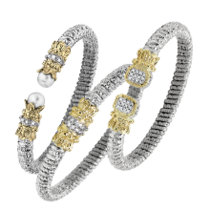 Today, I’m thrilled to share a fine jewelry line with you: Vahan Jewelry .... while I was looking through their site I was thrilled to see that I had seen Vahan years ago as a young girl. Their signature textured bracelets were Christmas gifts to my mom and aunts by my meme. It was the best kind of déjá vu, so I knew I had to style these pieces. Mix and match to create your personal style. Vahan is renowned for its classic floral petal design, and while that style is here to stay, this year Vahan has debuted something new. Presenting the Nuvo look. Look chic with VAHAN's classic styles and latest additions! Get connected to hear about how you can win your very own VAHAN bracelet! Vahan jewelry is the perfect mix of classic and elegant. These bracelets and rings are beautiful enough to draw endless compliments and questions of "where did you get that." Putting them on has been one of the best parts of my day because they go with everything, are made with such high quality, and make any day (and any outfit) feel special. I love Vahan and am now a fan for life. Something about a killer bracelet stack that just screams summertime to me! I couldn't wait to get a package of Vahan Jewelry's bangles and bracelets to play with, and they arrived at my doorstep just in time as the weather here in Nashville has been nothing but sunshine. It inspired me to take these jewels poolside for a fun photo shoot that would put these designs in their rightful element. You know how a great bag or the perfect pair of shoes can pull an entire look together? It's almost as if that particular piece makes everything else being worn less important. I could be wearing old jeans and a basic white top, but if my shoes and bag are on point, the whole look just works. Well, for me, jewelry does the exact same thing. To me inspiration is like air. It’s everywhere, most don’t see it, and you sometimes need to have faith that it’s actually there. Sometimes it hits you abruptly, and other times it’s a gentle whisper. After over a century of design, the time has come for us to open our vaults. Not so much our literal vaults, but those filled with the many stories behind the designs, the collections and the very evolution of the Vahan brand itself!